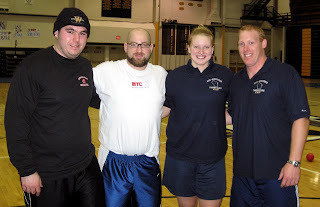 MADISON THROWS CLUB: MTC COACHES and ALUMNI WILL BE BACK IN WAUSAU AGAIN! MTC COACHES and ALUMNI WILL BE BACK IN WAUSAU AGAIN! LUKE SULLIVAN, JOE FRONTIER, JENNA MAHAFFEY, and LARRY EHRHORN will be headed back to WAUSAU WEST HIGH SCHOOL this February. THE 4th ANNUAL MID-WISCONSIN THROWS CLINIC, ON SUNDAY FEBRUARY 8th, 2009. We look forward to working with COACH JIM STEPHANY and all the THROWERS who can make it. Join us!